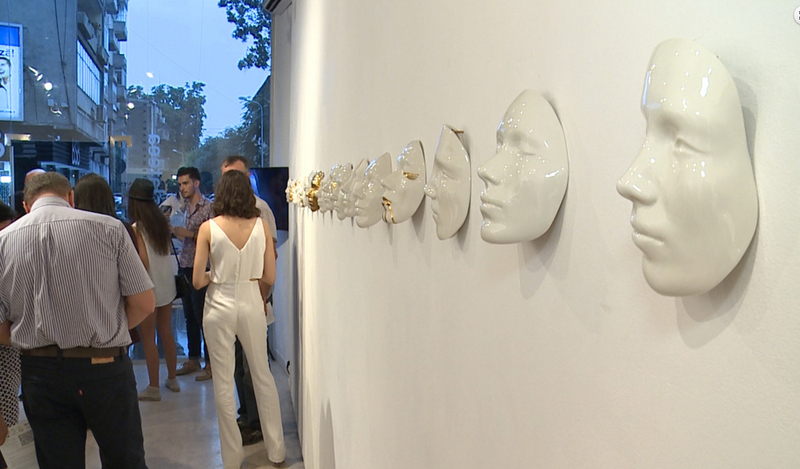 ​Ioana Maria Sisea is one of the most appreciated young artists in Romania. She completed her master’s degree at the National University of Arts, Graphics Dept., in Bucharest. Following a two-year private stipend in London (UK) she opened several exhibitions in Switzerland (Geneva, 2012), Netherlands (Utrecht, 2010) and Romania (Bucharest /Brancusi Hall & Cotroceni Palace/, 2010). Her works are in private collections in Switzerland, UK, France and Romania. “Dissimulation” is a collection, a showcase of moods, faces and facets. Ioana Maria Sisea portraits, amalgamates and analyses personality’s polarity by investigating the dual nature of the human structure. 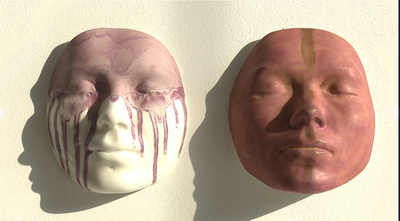 Nothing is pure essence, but, maybe, an incorrigible, yet incontournable alter ego. Each face has a printed sign, a spot or a scar, yet each spot has also an immaculate, unviolated surface. 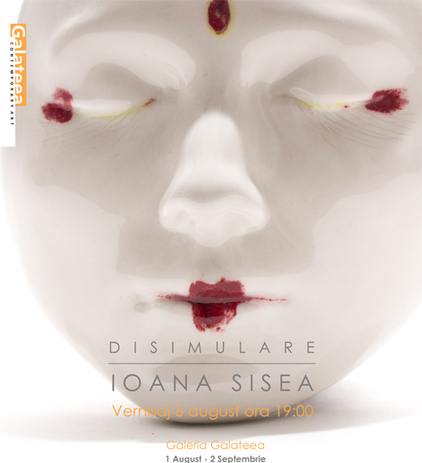 The exhibition stands for a visual development of human being’s plurivalence, a sincere debate upon admission and assumption. 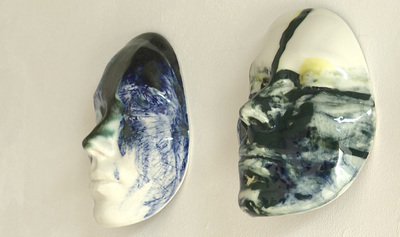 Ioana Maria Sisea’s masks show the sum total of all ego’s aspects, yet not only of the accepted ones, but, equally, of the aspects that are never remarkable, contestable or desirable. 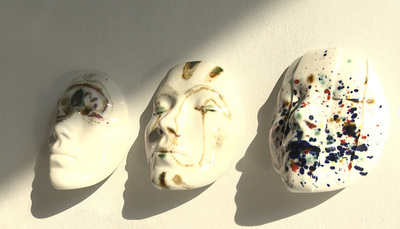 The ceramist displays her expressivity between the spotted and immaculate, colourful and colourless, shapeful and shapeless. 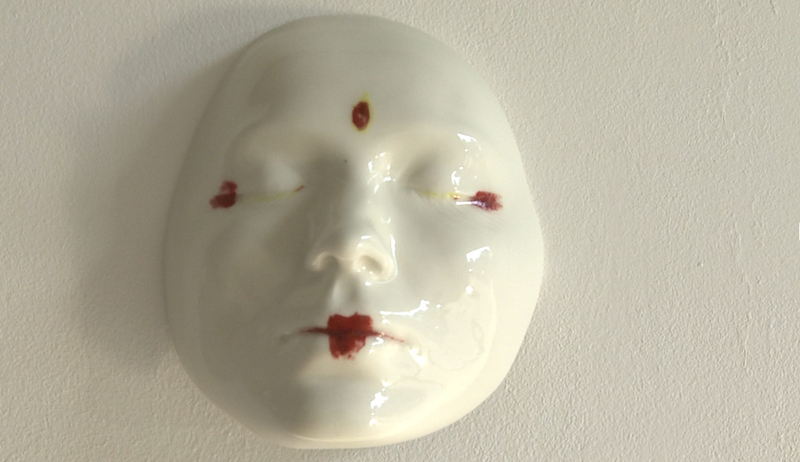 The distorted masks coagulate in organisms, pulsations, magic rituals and volcanic lava. 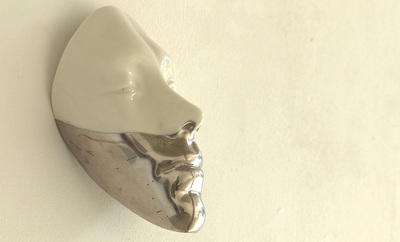 On the refined, smooth and elegant porcelain masks, the artist intervenes partially with incisions, adding them vigour. Like the main character in Jean Cocteau’s film Le Sang d’un poète, the faces the young artist looks at are but our fictive games, and we are her spectators.